Gaza attack: How Egypt’s military government helped isolate Hamas ahead of Israel’s offensive. A man walks from the Egyptian side of the border in a tunnel that once linked the Gaza Strip to Egypt, in Rafah, on Nov. 29, 2012. Sirens are reportedly sounding in Tel Aviv as rockets continue to be fired toward Israel. The rocket assault follows a series of Israeli airstrikes that struck more than 50 targets in Gaza. The Israeli Defense Forces have called up reserves in preperation for a much larger assault against Hamas. But has Hugh Naylor reports for the National, Hamas—despite its recent political gains—is in a severely weakened position at the moment, and it has a lot to do with actions by neighboring Egypt and, more indirectly, Iran. In contrast to former President Mohamed Morsi, a staunch backer of Hamas, Egypt’s new military government dealt a crippling blow to the organization by demolishing hundreds of the smuggling tunnels used to bring goods into Gaza, which has been under Israeli blockade since 2006. 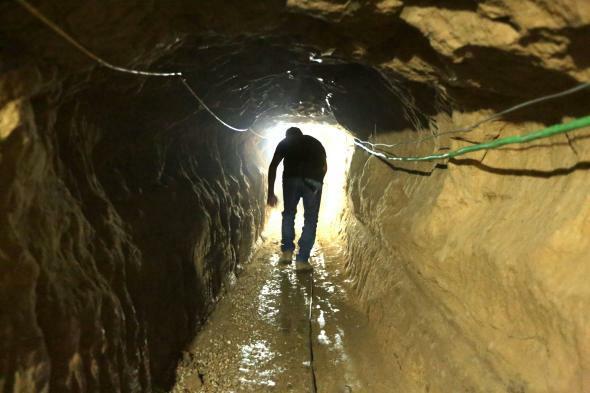 Hamas taxed the goods brought through the tunnels, and used the tunnels to bring in weapons. Egypt has also reportedly arrested or killed dozens of Hamas activists whom it accuses of working in tandem with the Muslim Brotherhood to destabilize the state. Hamas also lost a source of funding from the Iranian government after it ditched its longtime ally Bashar al-Assad and decided to back the Syrian rebels in 2012, though relations have apparently improved somewhat since then. It’s also likely that some of Hamas’ foreign financial backers may have redirected their efforts to the conflict in Syria. The movement has been in dire economic straights and has at times been unable to pay public workers in Gaza. Israel would almost certainly have launched some measure of military retaliation for the horrific murder of three Israeli teens. But it seems possible that it might not have launched the all-out assault it seems to be conducting if a military coup in Egypt and a civil war in Syria hadn’t transpired in such a way that it left the organization in a much weaker position. And so, Israel is getting a direct assist from Egypt and an inadvertent one from Iran to decimate Hamas. Meanwhile, the U.S. is tacitly working with Iran in Iraq while one of Washington’s staunchest allies in the region is expelling our diplomats. The region’s broader political picture is shaking out in some very unpredictable ways.